In 1988, Australia was busy celebrating its bicentennial, the Ronald Reagan era in the States was coming to a close, Allan Border was captain of the cricket team, the year’s big Aussie films included Crocodile Dundee and Young Einstein and the founder of The Crafty Pint was a 12-year-old at school in Gloucester, England. It was also the year Chuck Hahn introduced his first beer to the Australian market: Hahn Premium Lager. Initially a 100 per cent malt beer – 4.5 per cent ABV and hopped with New Zealand Super Alpha – it was stylistically a pilsener, but called “Lager” so as not to confuse drinkers. Over time, the recipe evolved, with alcohol content increasing and bitterness decreasing. “We discovered people were finding it almost too flavoursome,” says Chuck. Twenty per cent sugar was introduced and the hops were switched to Australian Pride of Ringwood for bittering and German Hersbrucker for late additions for aroma and flavour. The beer won the Overall Champion Beer at the Australian International Beer Awards in 1999, by which stage Lion Nathan (now Lion) had purchased Hahn and moved production of the brewery’s beers to Toohey’s. The original Camperdown site was renamed Malt Shovel and began producing, among other beers, the James Squire range. Hahn Premium continued to be brewed, but with little attention paid to it by Lion, who instead focused on the low carb Hahn Superdry. In essence, the Brewmaster wasn’t happy with one of the beers bearing his name and was trying to steer it in a better direction. He wondered if there was a way of enticing the growing craft beer community to revisit such a beer and was keen to get The Crafty Pint’s feedback on the first batch brewed with the fresh hops and increased late hopping regime. 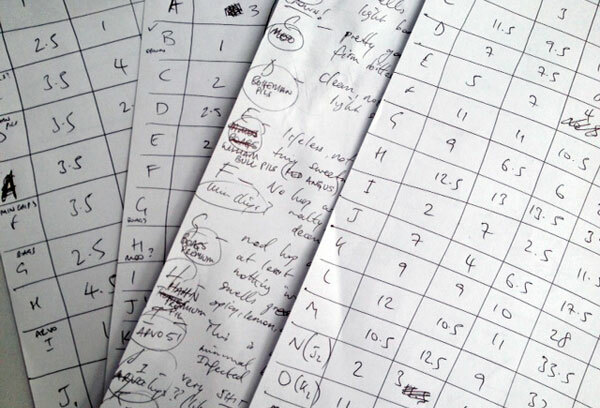 A case landed at Crafty Towers and, figuring our lone opinion was of limited worth, we arranged a small tasting panel. 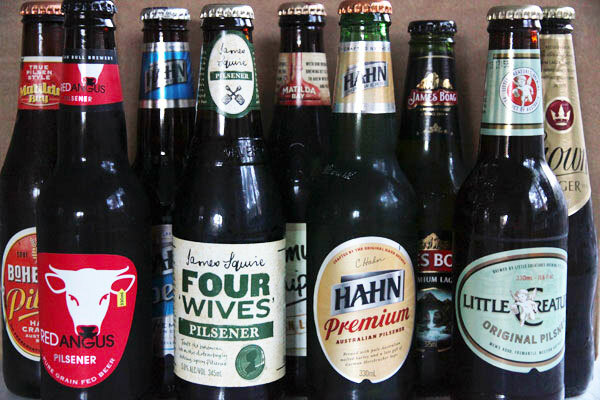 A collection of Australian lagers and pilsners / pilseners (predominantly from multinational operations) were collected and augmented by a few imports. They were tasted blind (read how below) and marked very simply out of five for each of appearance, aroma and flavour. There were 15 beers in total and, with a brewer having to drop out at the last minute, just three doing the tasting: The Crafty Pint, a beer rep and an ardent beer lover. There were a handful of good beers, with many clustered within a couple of points of each other. There were a couple of horrors. And there were some that we were able to identify: Boag’s Premium, Crown Lager, Minimum Chips, Trumer. More often than not the mass market beers were easy to spot, with unfortunate descriptors such as “cardboard”, “soapy” and “like drinking a supermarket plastic bag” cropping up. But there were also beers that displayed some subtle, occasionally complex hop characteristics, that were bright, balanced and left us wanting more. So, to the results and, in particular, how would the new Hahn Premium Australian Pilsener fare? The two Arvo lagers brought up the rear, although in fairness they had been sitting in a coolish, dark cupboard for a few months so their condition can perhaps be discounted. Crown, with its distinctive “We didn’t include Carlton Draught, did we?” aroma, was next. Which left just two. Both bags had green bottlenecks peeking out of the brown paper bags. One had to be Trumer, the other Chuck’s new recipe Pilsener. Moments later it felt like we’d been Derren Browned. Not only was Hahn the overall panel’s pick, it was the top rated beer by all three individually. “That’s absolutely amazing,” said Chuck when informed today. “I knew it was good. I had a couple of bottles last night and said, ‘Gee, this is alright.’ It just makes a difference with the fresher hops and the late hop additions. So there you go. The man who is able to say: “You know you’ve made it in Australia when you walk home and see your name in the gutter” had us hook, line and sinker. Sure, it was a pretty unscientific tasting, none of us are certified beer judges, the beers were pretty loosely lumped together stylistically, and – while the Hahn, Red Angus and Minimum Chips were sent to Crafty Towers by the breweries fairly recently – others were picked up from the likes of Dan Murphy’s and First Choice (as you don’t find them at crafty bottleshops) so freshness was unknown, and the Arvo Lagers had been kept in the dark for a while. Yet the Hahn was the standout for all three of us in a blind tasting. 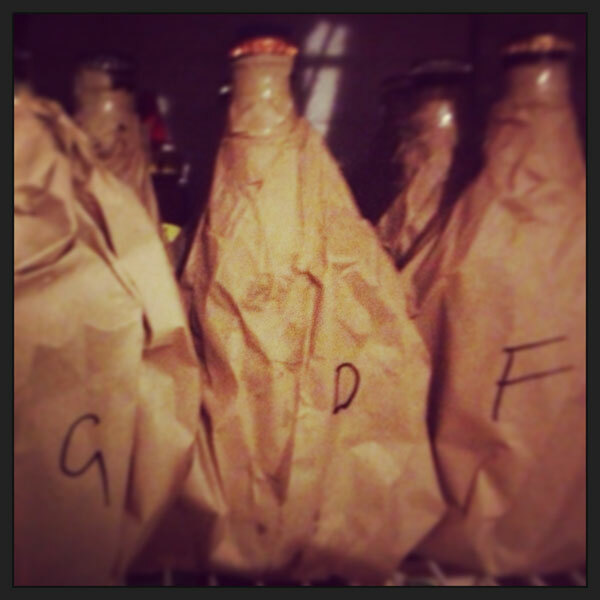 All 15 beers were placed inside brown paper bags and sealed closed with tape at the top. The bottle caps were all obscured with black marker pen. The bagged bottles were mixed up at random and then given a letter (A to O) before being placed back in the fridge. The person taking the beers from the fridge, opening and pouring them played no part in the bagging process. When being poured, the other two tasters looked away so they could see no hint of the bottle being poured. There is an improvement needed here as the pourer may have been able to identify some bottles from their size or shape. All beers were marked out of five for appearance, aroma and taste. These scores were aggregated, with only two beers where there was a marked discrepancy between the three scores. The bags, identifiable by their letter, were opened from last to first. In future, we will look at using stickers to obscure the caps and having someone pouring who is not judging.